Original Dauphine Hands, All in Superb Restored Condition. Of all the 1950s vintage Rolex Oyster Perpetual dress watches, the Bombé model is among the very best. The wonderful Bombé sculptured lugs case, here with an Ivory Cream dial, original Dauphine Hands and ‘Hearts and Arrows’ indices. This is a simply beautiful combination and one which always delights us. This is to our eyes the most attractive gentleman’s Rolex automatic dress watch by far. The sparkling clean, fully restored movement means this watch is now ready and set for many more decades of faithful service! 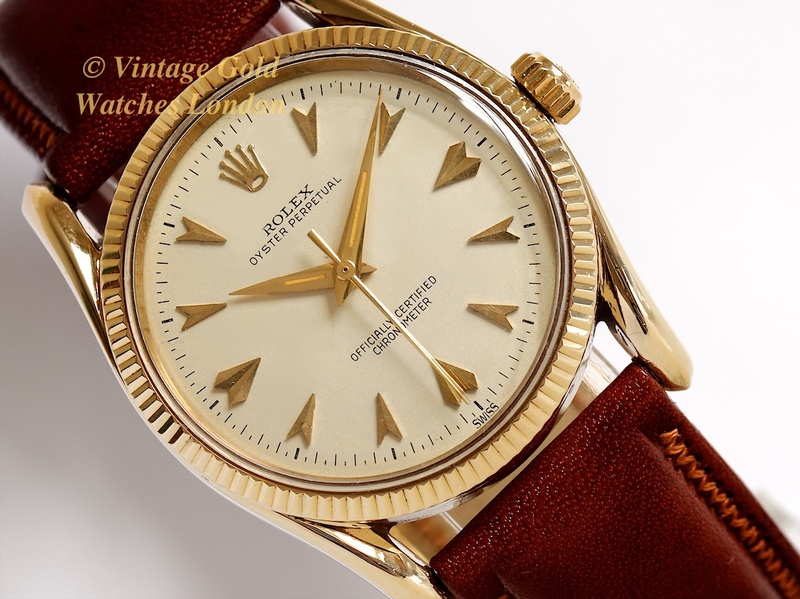 1950′s vintage Rolex dials are we feel, some of the best examples of the classical elegance this period is famous for. This precise dial, with the Rolex Crown at 12 o’clock, original Dauphine Hands and ‘Hearts and Arrows’ hour markers in gold around an Ivory Cream dial, is to our eyes, the most beautiful dial of the period. Here, it also looks particularly stunning due to the superb work of our dial restorers who are the best in the UK. It is therefore immaculate, no matter how closely one examines it. Even under high magnification, it looks as good as new. Again, very special in having the most attractive and the most desirable Bombé sculptured lugs, often referred to as a ‘Bombay’ case. This removes the block angles of the Oyster case and replaces them with the much softer and more fluid lines of the Bombé dress watch design. Compared side by side with the usual Oyster case, this looks far more classy and when you get to know the difference, there is no comparison. These are rare watches so if you see one and like it, we recommend you snap it up because prices are climbing. This time last year we were buying and restoring these for 15 – 20% less and the year before, the same! This lightly used example has only required professional cleaning and very careful gentle polishing to bring the solid 14ct yellow gold case back to showroom condition and it is showing hardly any signs of wear. In fact, we have carefully examined and photographed the case under high magnification and from all angles, and we are struggling to find any marks or other signs of wear or use. The screw-back design has its rubber seal intact and this is also in ‘almost as new’ condition. The case measures just over 33mm wide, excluding the Rolex Oyster crown and 40mm, including the lugs. Inside the case-back, all is as expected and signed MONTRES ROLEX SA, GENEVA SWISS, PATENTED with the Rolex model number 6593. It is all appropriately double hallmarked for Geneva and 14ct 0.585 gold. The case also carries its serial number on the outside between the lugs, dating the watch to 1951. The chronometer grade, Rolex Calibre 1030 automatic movement has just been serviced and is running perfectly. Again, it is immaculate following a complete overhaul by our vintage Rolex specialist watchmaker. This involves complete dismantling, close examination and replacement where necessary with only genuine Rolex parts, before careful reassembly and lubrication, again with Rolex specified lubricants only. This particular movement again looks incredibly clean and so the movement winds and sets nicely just as it should. After testing, following its overhaul, this watch is currently keeping accurate time to within +11 seconds per day. This is incredibly good for any watch of this age. Because of this, we are very confident in offering this watch for sale with our 12 months’ warranty* so for any issues within the first 12 months, you are very welcome to send it back to us for prompt attention and return. The movement is all correctly signed ‘MONTRES ROLEX SA GENEVA’, ‘SWISS’, and ‘TWENTY FIVE 25 JEWELS’. These movements are incredibly strong, accurate and reliable and with regular servicing, around every 4 years, we would fully expect this watch to run happily for another lifetime! We will be happy to assist you with competitive servicing throughout! Please note, while this watch may have been waterproof when new, this has not been tested and this is not guaranteed. We recommend all vintage watches should be kept clean and dry at all times. *Please note, our 12 months’ Warranty is only applicable if the list price is paid. A new high quality, Hirsch Ascot Brown Leather strap has been fitted with a gold plated Rolex buckle. However, if a different colour or style of strap is preferred, please let us know and we will do our best to oblige free of charge. We carry tan, conker, dark brown and black in stock in plain padded leather, crocodile skin or lizard skin. We can also obtain most types and colours from our partners at ‘Watch Obsession’ within 48hrs. Although there are no original papers with the watch, the numbers and markings are all correct, dating this watch to 1951. A detailed written receipt with 12 months warranty* and a separate insurance valuation for the replacement value will be provided at the time of sale along with our unique ‘Lifetime Authenticity Guarantee’ which states: “If this watch proves to be anything less than totally authentic, or not as described, Vintage Gold Watches of London will offer you a full refund at any time”. The watch comes complete with Rolex Inner and Outer presentation boxes, as shown in the photographs. This is a truly outstanding example of a 1950s vintage Rolex automatic which is ready to wear and quite appropriate and practical for regular everyday use. It is also a highly collectable piece from horology’s most famous name which if treated with care, will provide an excellent financial investment as well as be something for you to treasure and enjoy! A word on our prices – We always try our hardest to acquire the very highest quality watches we can find, before then restoring them to the highest possible standards. We then offer these at the fairest prices we can, taking into account our pre and post sales care and service. This approach means we will never be the cheapest, but nor will we be the most expensive. Indeed there are some well known stores in West London which are highly successful, charging between two to three times the price you see here. We therefore consider our prices to be fair, given the quality of watches we have to offer.